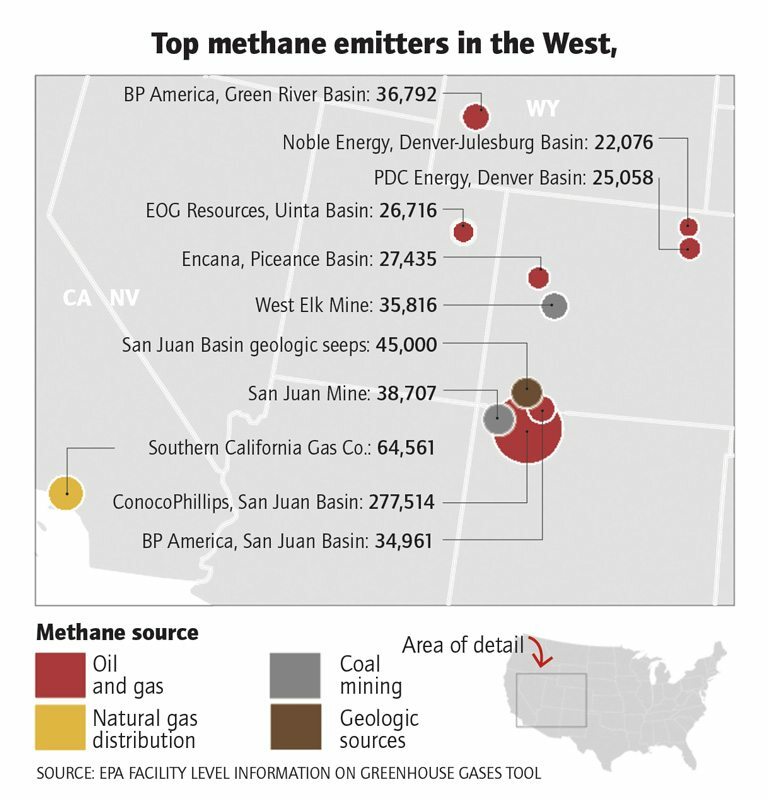 The San Juan Basin is home to the highest concentration of methane pollution in the United States. What is the methane hotspot? 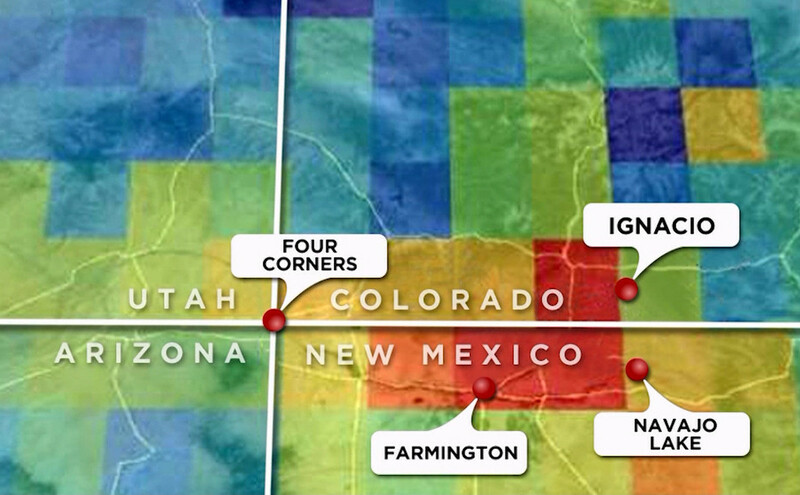 The Four Corners recently earned the unfortunate distinction of having some of the highest concentrations of methane pollution in the United States. This anomaly is a cause for serious concern – methane is the second most prevalent greenhouse gas behind carbon dioxide, and far more impactful. NASA and the University of Michigan released the report unveiling the hotspot in 2014, and in an August 2016 report they discovered that the natural gas extraction industry is responsible for a majority of the pollution. Scientists are still working to identify more sources of the methane, and identify their relative contributions, so decision makers can better manage the pollution. The Environmental Protection Agency (EPA) and Bureau of Land Management (BLM) each created the first ever sets of rules regulating methane pollution from the oil and gas industry in 2016. Since creation, however, both rules have been under attack by industry and the agencies that wrote them in the first place. Read below for the differences between the rules and current status. Good question. We know that keeping up with the different methane regulations can get really complicated, really fast. So we’re here to keep you in the loop on what’s happening, how each rule differs, and how you can help protect them. Right now, both the BLM and the EPA are working to delay implementation of their respective methane rules as they work to replace them with weaker versions. The EPA has the authority, under the Clean Air Act, to regulate the emissions of a single pollutant. The recently released EPA methane rule is the first ever attempt to regulate the gas. New and modified oil and gas facilities. The EPA rule requires oil and gas drillers to stop methane and Volatile Organic Compound (VOC) leaks and capture lost gas in production, processing, transmission, and storage – even from wells intended only for oil production. President Obama passed the EPA methane rule in 2016. In June of 2017 the new Trump Administration EPA announced a delay of the rule for first 90-days, and then 2-years. Courts ruled against the 90-day pause. In September of 2018, the agency officially proposed to drastically weaken protections and create loopholes for polluters. Any delay or weakening of the EPA methane rule is unacceptable. The rule was subject to a rigorous vetting process during its drafting and is crucial for preserving public health. We’re always watching for opportunities for public input and will let you know. The Bureau of Land Management (BLM) has the obligation and authority, under the Mineral Leasing Act, to manage federal resources to prevent waste. They also have the authority to charge royalties on resources extracted from federal lands, in this case natural gas. New, modified, and existing sources of methane. The San Juan Basin has more existing than proposed sources, so the BLM rule will particularly impact our region. The BLM rule requires oil and gas drillers to limit methane (ie. natural gas) waste on public lands. After months of threats from Congress to overturn the rule, the Senate voted in May 2017 to keep the rule intact. Since then, however, the Trump Administration has tried to delay implementation of the rule several times. They were blocked in the courts in October 2017, but launched another one-year delay attempt a few days later. With our partners, we submitted over 175,000 comments against the delay. Despite widespread support for the rule, the BLM announced their final decision to delay the rule for one year. So, along with our partners, we sued them. Then, in February 2018, they proposed “revisions” that would gut the rule completely. With your help and our partners, we submitted over 400,000 comments in opposition. Nonetheless, in late September of 2018, the agency announced it was rescinding most of the provisions of its 2016 methane waste rule. Again, along with our partners, we sued. 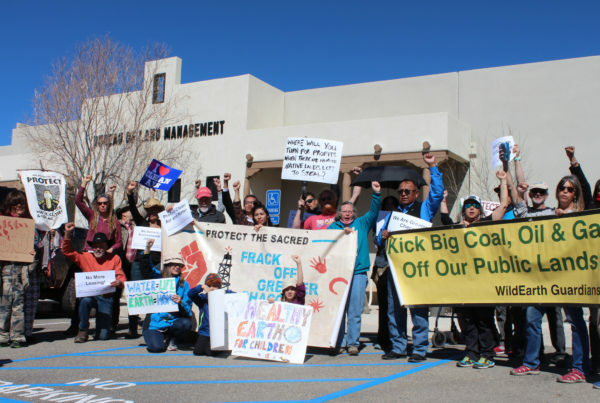 Secretary Zinke and the Trump Administration are attempting to gut the key elements of the BLM methane rule that are specifically critical to reducing the Four Corners Methane Hotspot. 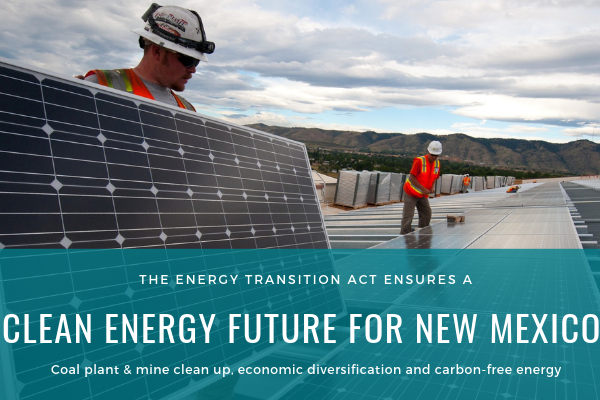 The Colorado Clean Air Act requires industry use currently available technologies to protect our health, welfare and comfort and ensure we have clean enough air to recreate safely outdoors. 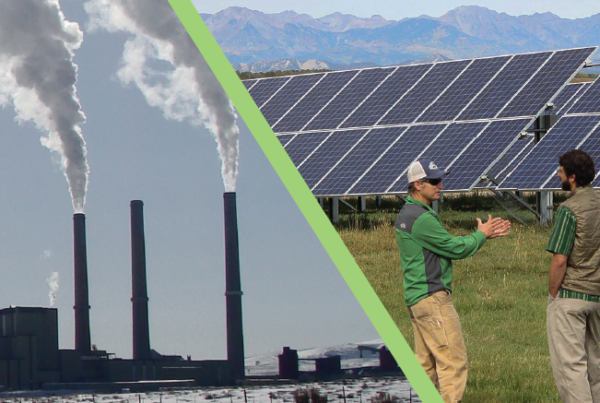 The Statewide Hydrocarbon Emission Reduction (SHER) Task Force, comprised of officials from the energy industry, local citizens groups, government representatives and other stakeholders, is reviewing whether or not Colorado should update minimum air emission control technology for oil and gas operations throughout the state. Oil and gas operations in the state of Colorado. The Task Force is considering emission control methods, such as requiring emission controls for smaller pollution sources, increased regular inspections and prompt repair of leaks, across the entire state. Most of the methods in consideration have already been tried on the Front Range. The SHER Task Force is meeting periodically throughout the year to review possible emission control methods and will have an official recommendation for action next year. Methane (CH4) is a colorless, non-toxic, and highly flammable greenhouse gas. When burned, it turns into carbon dioxide. Methane is emitted by natural sources such as wetlands, and through human activities, primarily oil and gas drilling and the raising of livestock. Methane is the primary component of natural gas, a fuel used for electricity generation that also contains other gases and volatile organic compounds (VOCs). Why is the hotspot bad? Methane, a powerful greenhouse gas, is far worse than carbon dioxide for the climate. 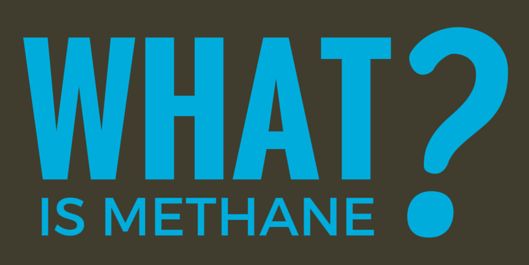 Over 20 years methane is 86 times more potent than carbon dioxide. In 2013, New Mexico alone wasted more than 250,000 metric tons of methane – double the greenhouse gas emissions of the state’s 700,000 cars. In the Four Corners, a region particularly vulnerable to the effects of climate change, these emissions must be cause for significant concern. Methane waste is wasted money. Each year oil and gas production on federal and tribal lands in the United States is wasting enough methane to supply Chicago for a year. These yearly losses are valued at more than $360 million, and could be recaptured and brought to market with existing technologies. As a result of this waste, taxpayers are estimated to have lost $32 million in royalties in 2013 alone. Methane alone is not a direct public health issue, but it is commonly associated with the concurrent release of volatile organic compounds (VOCs) and other toxic pollutants. These pollutants are linked to cancer, respiratory diseases and neurological damage. Methane is the primary component of natural gas. It is emitted into the atmosphere during the production, processing, storage, transmission, and distribution of natural gas for energy. Many wells, especially legacy wells, are not properly cased or cemented to prevent leaks and many others are designed to vent methane into the atmosphere. The Conoco-Phillips’ San Juan Basin oil and gas facilities, particularly their coal-bed methane wells from the Fruitland coal formation, collectively add up to be the largest single source of methane in the United States. Natural gas is often found alongside oil. Therefore, production, refinement, transportation, and storage of crude oil are also sources of methane emissions. In some circumstances, wells are designed to capture both oil and gas for market, but often natural gas is vented or flared and only oil is captured. The San Juan Basin is home to 26,000 active oil and gas wells, and over 11,200 abandoned wells. See our Oil and Gas program page for more info. Methane is also found in underground coal beds. Where a coal reserve meets the surface of the land, through natural seeps or mining, methane is released into the atmosphere. Sometimes this gas is captured, but often it is not. The San Juan Basin is home to three coal mines – Navajo Mine, San Juan Mine, and King Coal Mine. The basin also contains methane seeps, the most prolific of which is the Fruitland outcrop. See our Coal program page for more info. Several agencies, including NASA and NOAA, are currently investigating the sources of methane. In August 2016, scientists from NASA Jet Propulsion Laboratory released a report confirming that the energy industry (mainly the natural gas industry) is responsible for a majority of the methane pollution in the San Juan Basin. Additional studies from NASA and NOAA are underway and will further identify sources of methane in the area. Leakage of methane from natural gases processing facilities, like this one, are significant contributors to our methane problem. When natural gas leaks from wells designed only for oil extraction, flaring (burning the waste gas) is a method for dealing with the excess methane. Sign up for our email list here. You’ll receive the most recent hotspot news and updates on new ways you can help. Let your elected representatives know you want the BLM and EPA methane rules immediately, as they are. Find your representative’s phone numbers here!